I Have Won Prizes For My Art. My Name is Tenzin Jamyang. In 1982, I was born in a village called Chumur in the high Himalayan region of Ladakh. I was differently abled at birth, affected by cerebral palsy. I could not stand until I was 12 years of age. When I was 15 and able to stand and walk I joined the Tibetan School and studied until class 6th. 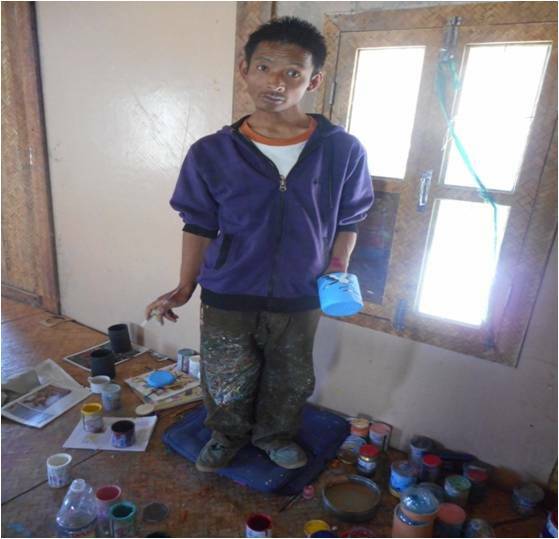 Till 2001 to 2010 I trained in painting at SOS then in 2011 I went to Manali for training in painting for 1 year. Soon after that I met someone who told me about PAGIR so I went to Shey to meet Mr. Mohd Iqbal who is the President of PAGIR. He told me that PAGIR is working for differently abled people and encouraged me to come to PAGIR. I was very interested and joined PAGIR in the year 2012 as painter artisan. I also participated in painting competition in DIHAR on behalf of PAGIR, and won a prize. I got opportunity to participate in every marathon on behalf of PAGIR. People discourage me while I am practicing. I don’t mind whatever they said now-a-days I am practice every day. This year MESH Designer and a Recycling Artist, Zeevic conducted a workshop in PAGIR making wonderful bowls and Yak's a elephants from Papier-mâché. Tenzin was part of the group. The new products will be on sale in MESH in time for the festival season.